There are moments in life when you feel you have done the silliest thing of life and you can't be more sillier than this. Even I used to think about myself the same until yesterday. Because I wanted to watch some new movie, I do not know what made me watch MSG-2. Yes, you are hearing it right. And I do not think I have ever had much lower moment than this in life when I was feeling too bad about myself to get trapped in something which is only abusing itself with every scene. This is the greatness of the movie. Audience do not have to abuse it, the movie abuses itself and you just have to witness this happening in front of you for 2 hours and 12 minutes. First of all, I would like to discuss the great plot of the movie. Some politicians and corrupt policemen decides to kill all the adivasis officially and finish them as they are too aggressive and have no guilt in killing human beings. 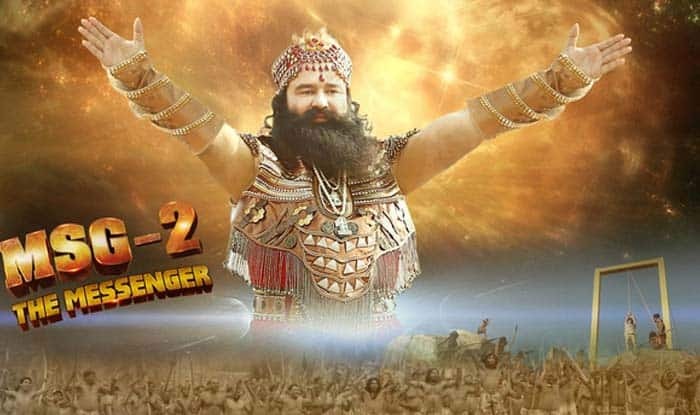 The hero of the movie.... (Yoooo.... Control yourself, guys..... he is coming...... finally, he is here.... oh yes... he steps on the Earth... oh phuckkkk... whole earth have started shivering with his arrival...) SHRI BABA GURMEET RAM RAHIM SINGH JI INSANNNNNNNNNN...... decides to save adivasis. He goes to the CM and asks for one month to make them "INSAN". Well, now the whole movie is based on this. The expressions of Baba's face is epic whenever he is angry or he is listening to someone. He tries enough to emote but in one or two scenes, 3 twigs of his beard did emote by moving. Even the jokes that Baba cracks makes you laugh like you are about to die next moment because with the kind of dialogue delivery that joke comes out, you can not resist yourself. And you find his followers laughing on these jokes in the movie. I feel pity about these junior artistes who had to do this job just to impress Baba and his Babaism. They could not have even abused him after the shot because Baba was present along with them on sets. The best parts of the movie is whenever Baba actually wanted to be a hero and does action scenes. The great thing is that no one ever came to fight with Baba alone. They always came with an army of not less than 500-1000 people. And you think someone would have killed Baba out of these 1000s? When Salman Khan and Suniel Shetty does not die, how can Baba? How dare you think like that? Baba is always standing in middle of these opposition armies. I do not know how army always managed to get baba in middle of them. And finally, Baba, who himself kept preaching in the movie to not beat or kill anyone, looks in anger and fury, then kicks so hard with his right leg that he jumps so high that he almost levels with the sky and comes down with such a great speed that as soon as his legs hit the earth, the dust blows with such a speed that all the 1000s of those people standing with tankers and all dies or gets disappeared. YO YO BABA GURMEET RAM RAHIM SINGH!! !